Black walnuts are nothing like their more familiar English cousins. English walnuts are fairly easy to access, with a sweet and mild flavor. Black walnuts feature a virtually impenetrable shell and much smaller nutmeats with a potent, almost industrial twang. The first time I sampled a black walnut, the taste reminded me of what hardware stores smell like when you first walk in the door — eau de Home Depot, distilled down into one little nut. I did not like it, or the nut, at all. This was a shock because, until then, I had yet to meet a tree nut I didn’t like. I’m a huge fan of almonds, pecans, and pistachios. I adore pine nuts and hazelnuts and macadamia nuts. I’m quite fond of cashews and chestnuts. And let’s not forget hickory nuts, perhaps my all-time favorite with their buttery, sweet maple flavor. Compared to all of those, black walnuts seemed like the last nut anyone would want to fold into ice cream or put into a pie. Yet, there it was in ink: an old family recipe from my Southern grandmother encouraging the substitution of black walnuts in her pecan pie. Which begged the question: Why would anyone want to ruin a perfectly good pie crust with a bunch of funky nuts? I had plenty of time to ponder this question, as black walnuts stay fresh in their shells for months, even years. The ones I had foraged remained in a basket in the dining room for quite a while, mostly untouched. Every now and then, I’d crack one open and taste it. Still stanky, I'd think, but not horrible. At one point, it seemed like a good idea to sprinkle some over a fall salad. To my surprise, I found them to be rather fetching, providing a rich counterpoint to the greens and a bold, complex flavor profile not unlike blue cheese. I appended a mental footnote to my original less-than-stellar review: great in salads! But I still couldn’t comprehend how they might translate into dessert. A little history: Black walnuts are native to the U.S. and Canada, growing wild throughout the eastern deciduous forests. The nuts were a staple of the Native American diet there, along with such other wild nuts as hickories, chestnuts, and butternuts (also known as white walnuts). These nuts were often ground with water into a nutritious nut milk the Algonquins called pawcohiccora; this was consumed plain or made into soups. By contrast, English walnuts are native to the Middle East and Asia; their origins are sometimes more accurately reflected in the name "Persian walnuts." Though the two nuts are related, they’re miles apart in flavor. 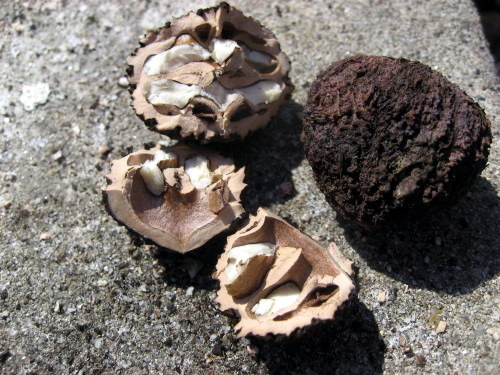 Black walnut trees grow wild from Massachusetts south to Florida, and west to Texas and Nebraska. They can be found on old farms and along the edges of woods, often in groves. Summer is the easiest time to locate them, when their fern-like feather-compound leaf structure is on display and the green fruits containing the nuts (they resemble large limes) can be spotted from a distance. The nuts drop to the ground in the fall when they’re ready — in September or October in New England — and you can collect them if you manage to beat the squirrels. Harvesting the nuts is messy, time-consuming work, a true labor of love (or ignorance, in my case). 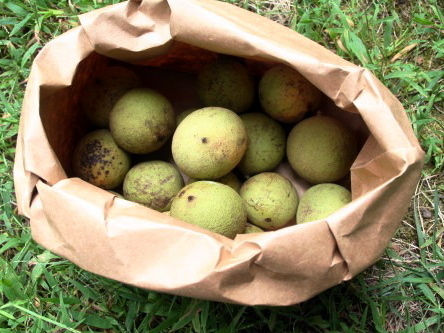 Wear grungy shoes and bring rubber gloves and a bucket, because the hulls of black walnuts contain a dye that will stain anything it touches, including your skin. Under the tree where you found them, stomp on the nuts and roll them around under your shoe until the hulls fall off. The husk material is not edible and contains juglone, a compound that kills other plants, so it’s best to let it compost where it fell. Once you're back home, fill the bucket outside with cold water and scrub the walnuts to remove the dye and any remaining husk material (again, wearing gloves). Discard the walnuts that float to the top (in my experience, floaters indicate insect damage or otherwise shriveled-up nutmeats). Set the sinkers in a single layer on a tray with plenty of space in between so they can dry thoroughly. Allow the walnuts to cure in a warm, dry place (such as an attic) for a month or two, safely away from pilfering critters. When they're ready to eat, crack them open with a hammer or a vise (I highly recommend wearing safety glasses here). Soaking the nuts in water before cracking them seems to soften the shells slightly, making the cracking process a little easier. If you'd like to skip all of that — or the foraging season has passed — you can purchase black walnuts online; they're available both in and out of the shell. These days, believe or not, I find myself craving these curious nuts. That polarizing flavor gradually crept into my subconscious and won't let go. I keep a bag of shelled black walnuts in the freezer and grab a handful when the cravings strike. Now I understand why Midwesterners are addicted. Recently, I experimented with the nuts in buttery shortbread cookies; the results were excellent. I have yet to graduate to a full-blown pie, but maybe someday. And yes, I've finally admitted it: I secretly kind of like the way hardware stores smell. p(bio). 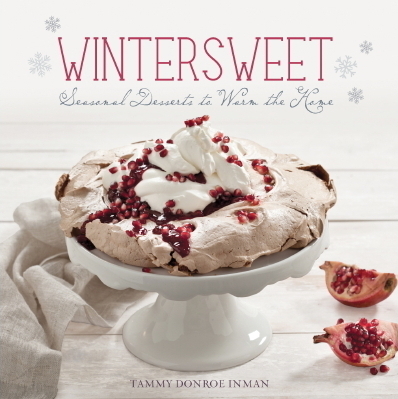 Based in Boston, Tammy Donroe Inman is a mother of two and author of the new book Wintersweet: Seasonal Desserts to Warm the Home. She blogs at Food on the Food.